Are you interested in finding a shutter company that cares about your window dressing needs? You’ve found one in American Blinds and Shutters Outlet. When you want your windows dressed up, we’re your leader in window treatment delivery and installations. The Orlando area is a wonderful place to live with our temperate weather conditions. But occasionally we do get some pretty strong weather. Whether it’s sunny and warm or rainy and a little cold, we’ve got the perfect window treatments for your home. In fact, your home may have windows that let in more light and energy than other windows in your home. While one window treatment may work best in one room, another room may require a thermal window treatment to handle direct sunlight. 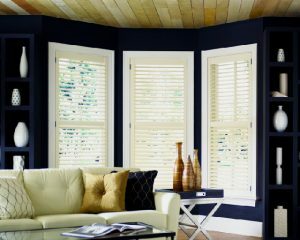 There are many kinds of window treatments available in today’s market including shutters and blinds. Each type of covering has it’s own benefits and aesthetic quality. Some are simply for added design elements and others also serve to help lower energy costs for your home. With better quality, you get better results and your window treatments last longer. Our team of window treatment professionals can install any type of window covering you desire. We have provided excellent service to the Seminole County, Orange County, and Lake County residents for almost twenty years. If you need shutters or blinds installed, you can count on our service company. Hurricane shutters are a common installation for us here in the Orlando area. If you want your home to be protected from hurricane force winds, you’ll need our hurricane shutters. Sometimes you need or would like an additional window treatment that will help to safeguard your home for privacy and energy needs. Window tinting is a feature that is commonly useful in those areas. Tinted windows provide you with privacy and also help to block the sun’s UV rays which cause energy transfer into your home. Drapes or curtains do a lot for a home. They add a more comfortable yet elegant feel to your living space. Drapes that are thermal backed can also help with your utility bills by keeping the sun’s heat out of the room. Curtains and drapes both provide excellent aesthetic qualities to your home’s design. They can take a room from simple with a country vibe to elegant and traditional. Modern design is also reflected in today’s drapery and curtain choices. Whatever pleases your design tastes can be created with these versatile window coverings. If you are interested in Shutters and Blinds or any other window treatments, please call 407-492-1009 or complete our online request form.